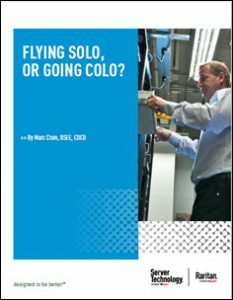 Choosing a Colocation Provider: Are You Flying Solo, or Going Colo? You are here: Home / Downloads / Flying Solo, or Going Colo? White Papers > Colocation > Flying Solo, or Going Colo? Incorporating intelligent racks, including power distribution units, environmental sensors, door access controls, asset monitoring, serial consoles and KVM in the IT equipment racks housed at remote colocation facilities is a low cost means of ensuring the IT equipment is using all the power being paid for, that data center hardware is operating in a safe environment, and that physical security is always maintained, thereby maximizing uptime and return on investment. Choosing a manufacturer that can support your company’s data center choice, whether to build a data center (“fly solo”) or move your IT assets into a colocation facility (“go colo”) doesn’t have to be difficult. Working with a vendor with a broad portfolio of data center products makes the decision easy. Download the new report from Server Technology and Raritan that aims to help enterprises make the decision to choose a colocation provider or building and operating an enterprise data center on their own.